More than 100 years after it was first discovered, and following on from decades of research by scientists and theologians alike, author Alexander Jones reveals a new and unknown approach to understanding the mysterious Antikythera mechanism. Since the dawn of society, mankind has striven to understand the forces that dictate history. Ancient Greeks found answers in fate, with shrouded white beings, known as the Moirai, depicted alongside the gods as the bringers of destiny. It would be easy to suggest that fate was at play in 1901, when sponge divers off the coast of a small Greek island stumbled upon the ruins of an ancient shipwreck, which just happened to be one of the most important archaeological discoveries of all time. The contents of the wreck, dating back as far as 60 AD, revealed untold wonders of the lives of the privileged in Ancient Greece. The vessel was laden with artistic masterpieces in the form of bronze and marble statues and intricate glassware and ceramics. Most important of all, though, was the unique Antikythera mechanism – the crumbling remains of an ancient gear-driven device, since dubbed the first analogue computer. ‘A Portable Cosmos’, written and researched by Professor Alexander Jones, from New York University’s Institute for the Study of the Ancient World, attempts to unpick the murky history of the Antikythera mechanism. The book presents the device as a gateway to the understanding of scientific thought in Ancient Greece, where the divine and the methodical were inextricably entwined. Jones takes the reader on a journey through the various years of research into the mechanism’s background, as well as into the device itself, affording a glimpse beneath the corroded surface and into the interior gears and cogs. Since its discovery more than 100 years ago, scholars and scientists have dedicated years of research to uncovering the secrets hidden beneath the mechanism’s corroded exterior. The symbols, writings, gears and cogs uncovered by years of investigation have revealed that the mechanism is some kind of advanced astronomical calculator, with dials given over to tracing cycles of time and the movements of the sun, moon and planets. Various theories have arisen as to the machine’s true function, with it being labelled as both an astrolabe and a planetarium at various stages throughout the 20th century. It was not until Derek de Solla Price began researching the object in the 1950s that the word ‘computer’ arose and with it the idea that the device could have been used to determine certain predictions and calculations. For Jones it seems unlikely that the mechanism was created to compute data in any practical way, but rather, was more likely created as a reflection of certain beliefs and aspirations in Ancient Greece. Navigational and other purposes would have been much more easily supplied by other, cheaper means, whereas the range and breadth of information expressed by the mechanism is far and beyond the realms required by any merchant ship. Instead, Jones poses the idea that the device may have served as vessel for teaching the ‘educated layman’ how astronomical phenomena were interwoven with the natural and social environment. Take a glimpse at Ancient Greek texts and one can see the presence of mechanical thought within the understanding of astrological forces. Vitruvius described the heavens themselves as spun about mechanically – viewing astrological revolutions as driven by a system of invisible, interlocking parts. For some, this theory went further, into the very nature of fate itself. Within the Antikythera mechanism, each astrological and chronological function had a rich context in Ancient Greek life and as such serves as the perfect gateway to understanding astronomy and scientific technology within society at the time. Just as fate and serendipity fascinated and guided the hands of ancient scholars, so too has it dictated the journey of the Antikythera mechanism, from a corroded piece of rubble to one of the most important discoveries of modern times. This is my first experience of Agatha Christie, courtesy of my good friends Prudence and the Crow. I will read just about anything, but and while I love a bit of mystery, murder mysteries don’t often cross my radar. Of course, I am familiar with Christie’s work – you can’t very easily go through life without hearing a thing or two – and have seen the odd film or TV adaptation of the famous Hercule Poirot, but that’s about it. In fact, it never even really occurred to me that I hadn’t read any of her work until I received this book. In signing up to PATC I wanted to widen my readership and force myself to discover new books, and this is exactly what I got. Amyas Crale was murdered, poisoned in fact, of that there is no doubt. But who placed the poison in his cup? This is the question Hercule Poirot is hired to answer, some sixteen years after Amyas’ wife, Caroline, was found guilty of the murder. The couple’s daughter, Carla Lemarchant, approaches Poirot to investigate after receiving a letter from her mother, written just before she passed away, protesting her innocence. Poirot willingly accepts the case, but soon fears that it may be just as clear cut at it originally appeared. All leads seem to point Caroline, but something’s not quite right. It’s up to Poirot to revisit the past, and solve a murder, in retrospect. Murder in Retrospect was published under the name of Five little Pigs in the US, whether or not this changes your understanding of the novel I cannot say, but for me, at least, it was a bit of a dead end. The ‘five little pigs’, alluded to in the American title, are the five suspects in the murder case – Amyas’ good friend, Philip Blake; Philip’s brother, Meredith Blake; Amyas’ mistress, Elsa Greer; Caroline’s younger half sister, Angela Warren; and Angela’s governess, Cecilia Warren. Each suspect is represented by a different little piggy from the well-loved nursery rhyme I’m sure you are all familiar with – and they vaguely fit into these roles, Elsa Greer, the greedy little swine with whom Amyas is said to be madly in love, is the piggy with the ‘roast beef’, for example. “This little pig went to market, this little pig stayed at home…” Poirot mutters to himself, briefly profiling the different suspects, as Carla explains the background of the murder case. Really, this is as far as the Five Little Pigs analogy goes – it doesn’t really add much to the story, it’s more just comes across as an odd little mannerism of Poirot’s. There is, of course, no evil, murderous pig in the nursery rhyme. When reading a mystery novel, half of the thrill is in trying to work out the answer for yourself, and generally speaking, it’s quite easy to spot the different motives characters might have for wanting knock off the murder victim. This book, though, is a bit different. From the very beginning it’s difficult to comprehend exactly how Caroline Crale could possibly be innocent – she was furious with Amyas, she threatened to kill him, she served him the beer which dealt the fatal blow, and, no one else really has a motive. The only thing which doesn’t add up is why, if she was guilty, Caroline would suddenly attempt to reclaim her innocence on her death bed. Why would she write a letter to her daughter asking for her to find the truth, if indeed she was guilty? It is almost infuriating to read, because it seems so obvious for Caroline to be the one who poisoned Amyas, but of course, no mystery novel is complete without a mystery, and so it must be one of the other five – but how? The book follows the classic structure of a mystery, but with one key difference – Poirot never actually visits the scene of the crime, and relies instead on just the testimony of the suspects. As an inspector Poirot is perhaps best known for this. So, in this case, Christie chooses to exaggerate Poirot’s main character trait, by having him to solve a crime completely in retrospect, sixteen years after it took place, with only the, somewhat blurry, statements of those involved. This requires revisiting the day of the murder through the minds of the five suspects, and as such, the reader must reread the same story over and over again. I normally hate it when authors choose to write a book from two different points of view, with alternating chapter retelling exactly the same scenes – get on with it already! – but in the case of a crime scene I think it works really well. With each retelling of the story, another piece of the puzzle is added, creating a richer image of the scene, and leading the reader, as always, to the wrong conclusion, before the true murderer is finally revealed. My overall opinions having finished the book are definitely positive; Murder in Retrospect is a creative twist on a traditional murder mystery novel which is sure to be a hit with fans of the genre. It took me right until the end to solve the puzzle, and I was lead of a marvellous goose chase throughout, falling into each and every trap that Christie set – what more could you ask for? I’m sure I don’t need to recommend Agatha Christie to anyone, if you are a fan of murder mysteries then you will undoubtedly like this one – but you already knew that, didn’t you? I would be lying if I said I didn’t enjoy reading the book, but I’m not sure whether I will delve further into Christie’s vast repertoire. It is easy to see why there has always been such a strong following of murder mysteries and of Christie in particular – there is certain thrill in trying to solve a puzzle before the detective which can be somewhat addictive – but I’ve never really been particularly taken by the genre as a whole. On the whole, it was interesting to experience Christie’s work for the first time, but I think, for now at least, the case is closed for me. Is there anything more wonderful than treating yourself to a new book? Last month a friend introduced me to Prudence and the Crow, a little london-based company which offers monthly subscriptions of vintage paperbacks. She pretty much had me at the Crow. …I’m sorry, that was terrible. Anyway, after visiting their elegantly designed website and learning a little more I wasted no time in signing up. A vintage paperback and extra SURPRISES for only £12 a month, seriously, you’d have to be an idiot, or some kind of book-hating weirdo, not to get in on this. Today my first package arrived and I am fairly sure I have never been so excited in my entire life. The envelope alone was enough to get me to screaming like an excited school girl. 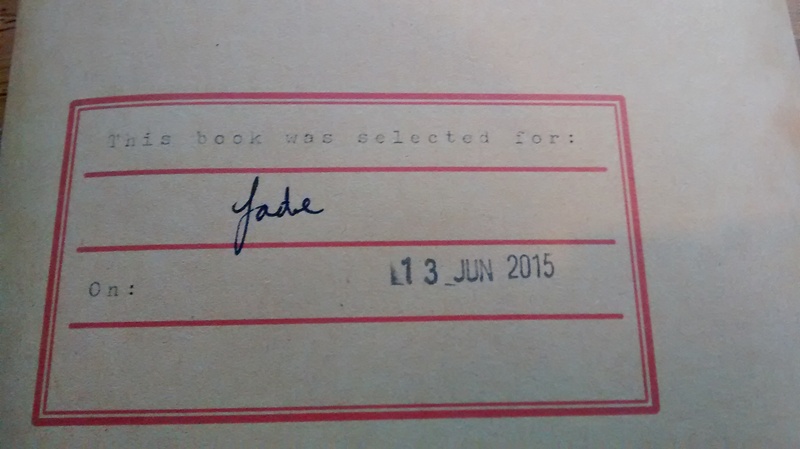 A mystery book, selected especially for me! 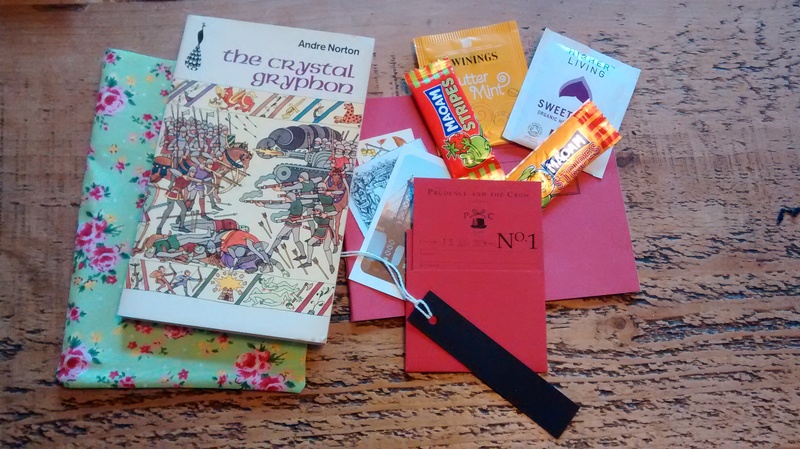 The box was filled to bursting with all kinds of treats including a handmade book bag and bookmark, Prudence and the Crow library card, motivational mini postcard and a collectible tea card featuring an English spindle tree. I also got some interesting tea samples and a few sweets adorably packaged in a striped bag and sealed with a triceratops sticker. I love every, single thing. I’ve never heard of Andre Norton, but I am super stoked to try this one out. Kerovan of Ulmsdale is born different from other children: he has small hoofs instead of feet, and his strange eyes are the colour of amber. Fearful tales spread about Kerovan – but is he really a monster, or has he inherited some of the power of the mysterious Old Ones who inhabited his country long ago? And what about the potent magic of the crystal globe he sends to the bride he has never seen? The blurb-cover combo on this book has me well and truly intrigued. I’m moving this straight to the top of my ‘to read’ list, so I’ll let you know what I think really soon! In the mean time, get on over to Prudence and the Crow and treat yourself! Raitt Black was raised in New England, where he developed a love of literature. He tells me “I grew up reading books of all kinds”, before revealing that his favourites are “fantasy, science fiction, and horror”. Black first discovered a love of writing while in elementary school and it became a passion that he continued to feed as he progressed through high school. After studying for a BA in communications and relocating to the warm beaches of California, where he was to meet his future wife, Black began work on his first novel. He describes his writing as primarily fantasy with elements of mystery, love and horror. His debut novel, The Dain Princess, was released in 2013. The Dain Princess introduces the reader to Lyhnzi Kole Dain, the only living heir to the fictional Innbern Kingdom. A colourful and feisty young girl, Lyhnzi spends her days training for battle with the castle guards and creating mischief with the hired help. Despite her comfortable existence, Lyhnzi yearns for adventure. When the opportunity arises to leave her home of Matraigh and stay with family on the coast she jumps at the opportunity, completely unsuspecting of the terrifying fate that awaits her. In the story that follows, Lyhnzi finds her understanding of good and evil challenged as she realises that those that she thinks of as friends or foes may not be all they seem. This novel would suit a young adult audience – while I enjoyed the story, I’m sure I would have appreciated it even more if I were a few years younger. The universe of The Dain Princess appears very similar to and yet considerably behind that of our own world, with armoured guards, gilded tapestries, cities enclosed within castle walls and travel by horse and cart, as if stuck within the realm of medieval Britain. It takes some time before elements of fantasy work their way into the text and I think this works really well. In Black’s world, the fantastic walk among everyday people rather than exist in an entirely alternate enchanted world. As the story progresses the children learn of some of the horrors lurking in the trees. One creature in particular stays hidden just out of sight throughout the majority of their journey, quietly stalking the children by day, and emerging at night with a signature blood curdling scream. With the creatures kept at bay only by the light of the fire, the children find themselves coming closer and closer to the burning red eyes of the creatures of their nightmares. The Dain Princess has many elements of a classic coming of age novel. As with much young adult fiction, the reader grows with the characters. Encompassed within this is the theme of trust, which runs throughout the novel. The characters are forever asking one another “why should I trust you?”, and having their whole understanding of trust completely redefined. Those who seem the most trustworthy in the traditional sense, those Lyhnzi has grown up with and those who swear to protect her, may have ulterior motives in mind, whereas the most unlikely characters become the most genuine. The reader finds themselves following Lyhnzi on her journey of self discovery and she grows from a teenager into a woman, learning to ignore traditional stereotypes and have confidence in her own instincts. The story does have a few editing issues. However, I think that with self-published novels this is somewhat inevitable, and while a professional editor’s eye would undoubtedly improve the novel I don’t feel that the issues dramatically detract from its merits. There are also a few characters whose stories I don’t feel are properly concluded at the end of the book. The reader may find themselves with a few questions left hanging in the air. On the whole I found The Dain Princess to be an engaging and fun read. Black’s work contains elements of horror, mystery and fantasy, which when combined make for a well structured and entertaining novel. I would recommend this book to young adult readers, and those who have read and enjoyed the work of Philip Pullman and other fantasy novelists. 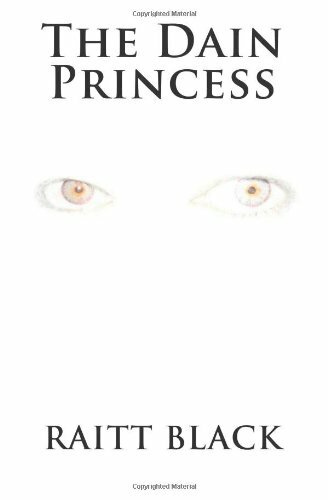 Many thanks to Raitt Black for providing me with a free review copy of The Dain Princess. I’m fairly sure I said I will ‘try’ and upload one review a day. This one’s only 11 days late! 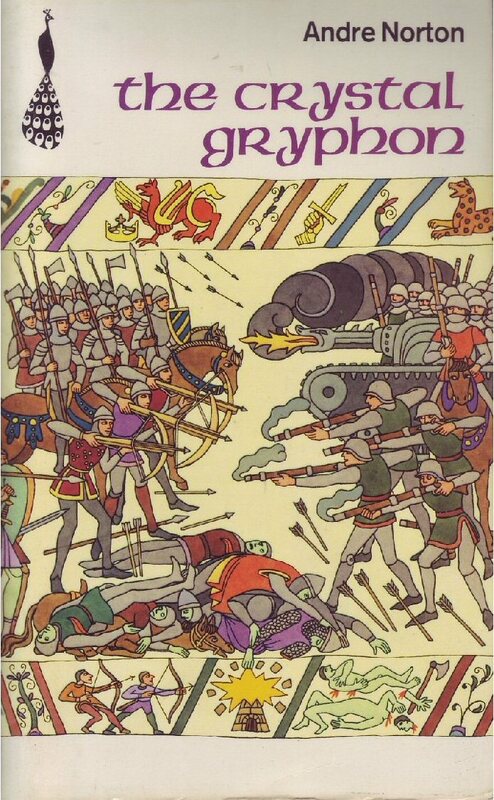 John Buchan published this little novel in 1915. The newest edition has been published as part of Penguin’s Great Books for Boys collection, and it really is a great book for boys. On a side note, I actually came across this hidden on my partner’s book shelf, a lovingly inscribed present from his grandfather. I have heard elsewhere that everyone has an inner adventurer that will love books such as this. While this may be true for some, I think it is misleading to say everyone loves an adventure. If you do however, this is the book for you. The Thirty-Nine Steps is set four weeks before the commencement of World War I. The story is that of Richard Hannay and his unlikely entanglement in a German plot to steal secrets from the British military. The story begins with Hannay lamenting on how boring life has become, and wondering if leaving the country would award him a more exciting life. This all changes when Hannay meets for the first time his upstairs neighbour. The neighbour, Scudder, confesses to Hannay that he is in grave danger and in desperate need of a place to hide. Scudder is a US spy with knowledge of an assassination attempt, due to take place on June 15th, which if successful will ravage Europe. Hannay believes Scudder and decided to help him out. However, when the very next day Hannay arrives home to find scudder himself has been murdered, he realises just how much trouble he is landed himself in. With both the police and the killers after him, Hannay decides to go on the run until the assassination is due to take place, with the hope of stopping murder before it’s too late. Hannay is chased through England to the harsh Scottish wilderness, pursued by a mysterious aeroplane, as well as the London police. The novel follows Hannay through exciting chase scenes and incredibly narrow escapes, all while Hannay tries crack the code in Scudder’s diary – the key discovering where and when the assassination will occur. Hannay discovers the kindness of strangers who prove invaluable to his journey. 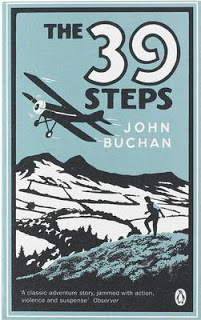 An adventure loving reader will be kept engrossed by the mystery of “the thirty-nine steps”, Hannay must discover the meaning of this riddle in a race against time. While this book isn’t necessarily the sort of thing I would normally choose to read, I did actually quite enjoy it. Although I do feel it’s more of a boy’s book – I think it would make a fantastic gift for a young boy who loves to read. I won’t spoil the ending; nothing ruins an adventure like a spoiler. One of the things I particularly enjoyed about this book was the attention to detail Buchan used when describing scenes and people. I love the way Hannay can go from looking like a fine upstanding gentleman, to a dishevelled traveller, to a weathered road worker, and back again while all the time his image is kept meticulously clear in your mind. I cannot stress enough that this is definitely a book for adventure lovers, and I feel it may also be appropriate for those with an interest in World War I. Having been set around the time of the war itself it may be interesting to examine the novel in relation to history. Buchan is said to perfectly capture the feel of the time period.